Thanks to a $10 million philanthropic donation, the University of California, Los Angeles, will establish a new research center dedicated to addressing the complex needs of children in foster care, particularly related to the educational system…. The Pritzker Center for Strengthening Children and Families also hopes to be a resource for foster parents, relative caregivers and adoptive families through trauma-informed training that can help support the academic achievement of foster youth, according to the center’s new director, Tyrone Howard. 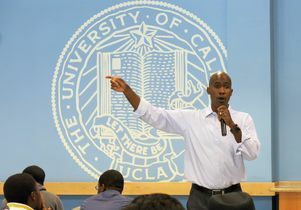 Dr. Clarence Braddock, vice dean for education at the UCLA David Geffen School of Medicine, said in a statement that although the Trump administration’s immigration policies have not yet had a significant, direct impact on UCLA’s residency programs, he and other faculty are concerned about the long-term implications for the broader health care community and for patients. “We need more physicians to meet the country’s growing health care needs, and the anxiety and confusion caused by the proposed travel ban and end of DACA present a barrier for foreign-born or undocumented physicians seeking to practice medicine in the United States,” Braddock said. Residents of dense, transit-friendly San Francisco emit an average of just 6.7 tons of carbon dioxide per year, according to a 2015 report from the University of California, Los Angeles. By contrast, the average in the broader Bay Area is 14.6 tons, in part because people drive farther to work. “We have overpromised and under-delivered,” says Brennan Spiegel, a physician and director of health services research at the Cedars-Sinai health system. “I consider myself a techno-skeptical techno-philiac. But there are way too many people in the Silicon Valley echo chamber who have never touched hands on a patient and don’t understand how hard digital health is…. Digital health is not a computer science or an engineering science; it’s a social science and a behavioral science,” says Spiegel, who is also a professor of medicine and public health at UCLA. “This is about a company breaking Facebook’s terms of service and going rogue,” said Sarah T. Roberts, a UCLA assistant professor of information studies. “That’s a pitfall that will exist no matter what policies are implemented. Daniel Swain, a climate scientist at the University of California at Los Angeles not involved in this work, said the Cohen study was consistent with work with which he has been involved, that has shown an increasing tendency for a cold-East, warm-West pattern during winter in recent decades. “It’s also striking that these changes have coincided with substantial climatic upheaval in the Arctic, where accelerated warming has recently caused sea ice to drop to record lows,” Swain said in an email. Tananarive Due is an author, screenwriter and lecturer in the Department of African American Studies at the University of California, Los Angeles, who teaches a course entitled The Sunken Place: Racism, Survival and the Black Horror Aesthetic. “I realised that Get Out was worthy of academic discourse immediately upon seeing the film,” she says, “I modelled an entire black horror course around it. The BFRB Precision Medicine Initiative is being led by investigators from UCLA, the University of Chicago, and Massachusetts General Hospital. The study will investigate the clinical, biological and genetic underpinnings of body-focused repetitive behaviors and collect data that will form the basis for more effective treatments. Since then, Mac has done highlight versions (including at UCLA) and the full show broken down into four six-hour chapters. UCLA’s Center for the Art of Performance is presenting the L.A. version, presumably the last complete one, at the Ace, where the show is being filmed. Though handgrip strength has long been used as a quick, easy and noninvasive way to gauge cardiovascular functioning, this study is among the first to link handgrip strength measurements with actual structural changes in the heart muscle, according to Dr. Deena Goldwater, an attending cardiologist and geriatrician at the David Geffen School of Medicine at the University of California, Los Angeles, who was not involved in the study. “Grip strength is a great metric. It’s quick and easy to perform in the office, and the results are available immediately, unlike blood work or imaging,” Goldwater said. (Commentary written by Mark Gold) Clearly, our earlier successes were more behavioral than structural. If lawn removal and new efficient fixtures and appliances had saved all that water, we wouldn’t be seeing this momentous backslide. Meanwhile, our sources of imported water — from the Delta, the Colorado River, and the Los Angeles aqueduct — have all been revealed as vulnerable to politics, drought, climate change and crumbling concrete in recent years.